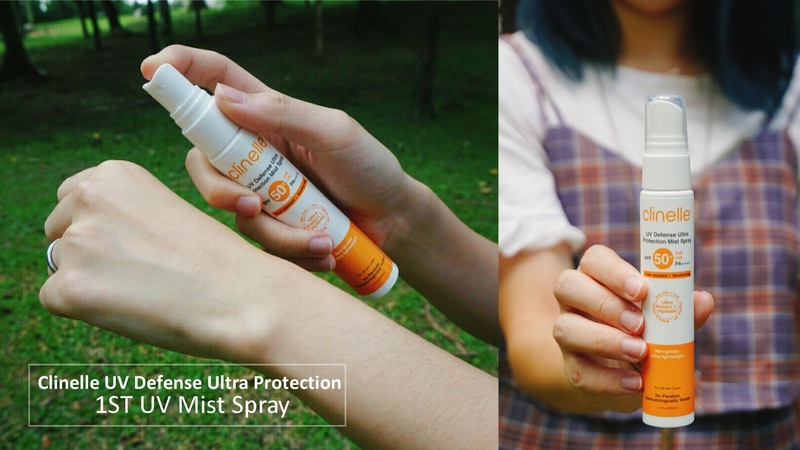 Do you wish hands on the highest sunscreen protection Mist Spray and to use it Anytime and Anywhere you wanted? This might be your most preferred sunscreen choice too! 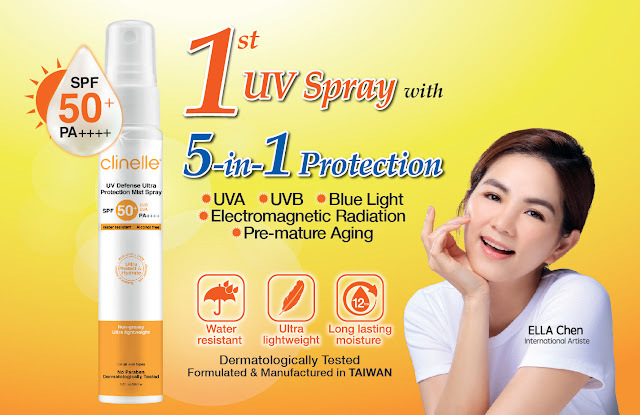 Introduce new launched Clinelle UV Defense Ultra Protection Mist Spray SPF50, PA++++ will be the first UV Mist Spray with 5-in-1 protection against UVA, UVB, Blue Light, Electromagnetic Radiation and Pre-Mature Aging. 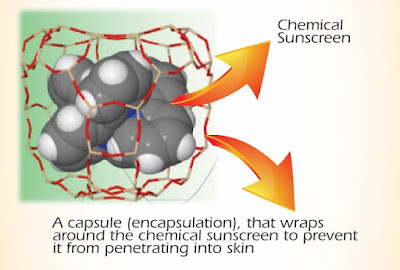 The only sunscreen product dedicated for face use that offers the highest level and most complete protection to shield against outdoor UV rays from sunlight and indoor UV rays emitted from technology gadget. The new Sunscreen Protection is designed in this super pretty bright orange color packaging. If you have used their UV Defense sunscreen in tube packaging before, this color packaging must be familiar to you. I have been using the UV Defense sunscreen as my daily sunscreen now too. Now with the new mist spray bottle launching, I will bring this super sleek spray with me whenever I go! All Clinelle products are carefully formulated with RX3 Action to Repair, Refine and Reshield the skin with no exception for Clinelle UV Defense Ultra Protection Mist Spray SPF50, PA++++. This daily defense is infused with highly effective ingredients to shield and protect the skin from the harshest UV damages while it keeps the skin moisture at the deepest layer of the skin.
. Clinelle reinforces its suncare innovation by including Glycogen, a new breakthrough key ingredients for supreme sunscreen protection that derived from the natural purified marine source and empowered with Protec-E Technology which is proven to deliver superior results as superb UV filters to protect and repair skin damage resulted from the exposure of outdoor and indoor UV rays. This combination of encapsulated UV filters binds strongly and doesn’t break easily under the sun exposure to provide long-lasting protection. New advanced Encapsulation Technology that provides 5-in-1 Ultra Protection again UVA, UVB, Blue Light, Electromagnetic Radiation and Pre-Mature Aging. It is a high-performance product that is water resistant and remains on the skin surface to prevent chemical sunscreen from penetrating into the skin for safer long-term use. This Clinelle UV Defense Ultra Protection Mist Spray SPF50, PA++++ not only works as sunscreens but also targets to work on skin refining too! Clinelle UV Defense Ultra Protection Mist Spray SPF50, PA++++ is infused with Organic Super Hyaluronic Acid with superior moisture-retention properties up to 72 hours and works 2x as much on skin moisture compared to synthetic hyaluronic. 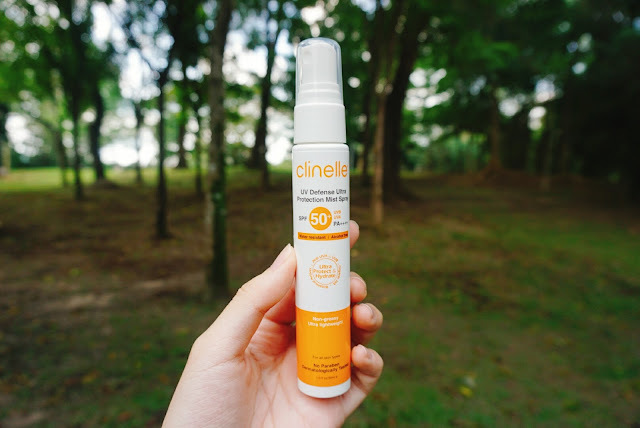 This further proven, Clinelle UV Defense Ultra Protection Mist Spray SPF50, PA++++ is the better option, especially after perspiration or swimming. Last but not least, Clinelle UV Defense Ultra Protection Mist Spray SPF50, PA++++ is enriched with botanical ingredients consist of Cucumber, Aloe Vera, and Squalane extracted from Olive Oil. Precious extracts derived from 3 botanical ingredients work synergistically to provide additional moisturizing benefits for a soft, supple skin while providing gentle soothing care after sun exposure. 1. Remember to shake well the mist bottle before use. 2. 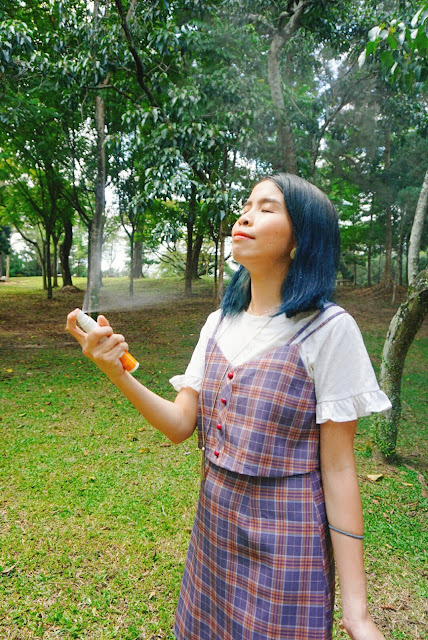 Hold bottle 10 - 15 cm away from your face and spray with your eyes close. 3. Lastly, just gently pat dry evenly on your face. From the image above itself, you can see there are bigger patches of the UV Spray on my hands. 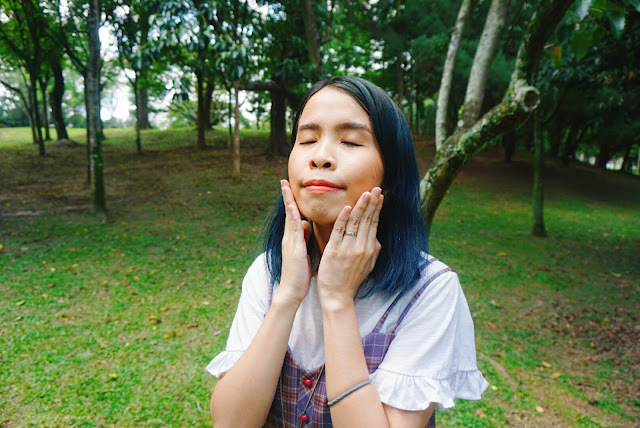 This is normal when you start using Clinelle UV Defense Ultra Protection Mist Spray SPF50, PA++++, make sure to shake well before you use or spray on your face! The packaging and spray nozzle was developed with consumers in mindset. Clinelle wanted to ensure consumers are able to experience the convenient with the packaging designed to be handy to allow reapplication at any time and anywhere, even over makeup. 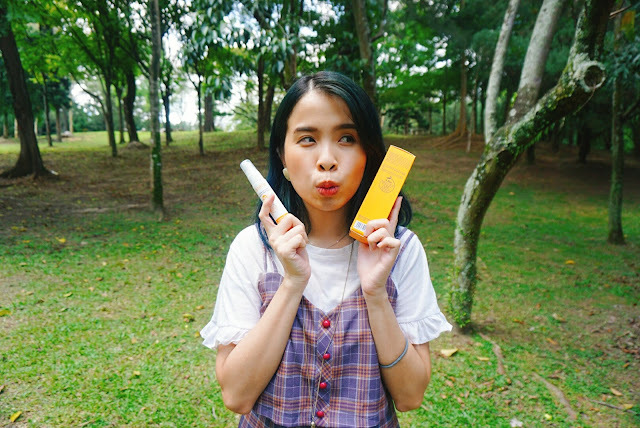 While, the spray format allows for an even distribution of the sunscreen on the face with an ultra-lightweight, waterproof and non-greasy effect. I love the entire concept of this mist spray sunscreen. The design wise is really compact and sleek. It works just like any mist spray you already had but this comes in 5 in 1 function, which works not only works as mist but also sunscreen protection. Sunscreen at most time can stay on face for 4 to 5 hours. 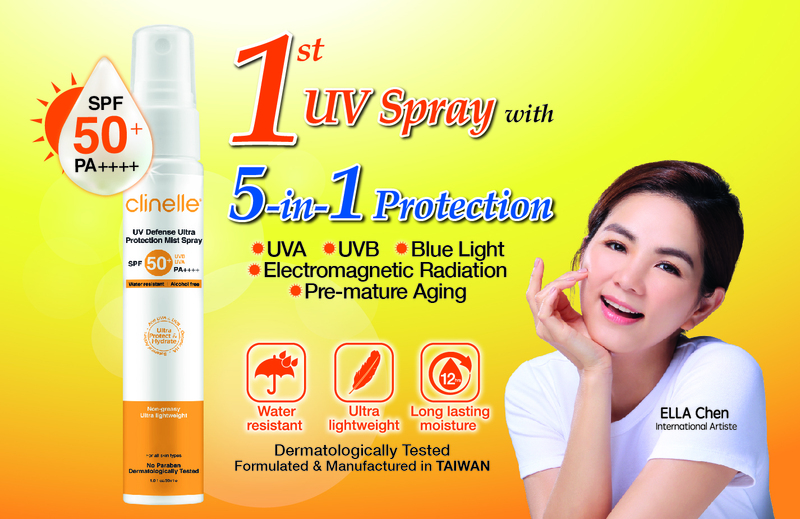 To maximize the protection, you can always use Clinelle UV Defense Ultra Protection Mist Spray SPF50 PA++++ to spray on your face or skin when you needed so that your skin can stay protected under the UVA, UVB, Blue Light, Electromagnetic Radiation, and even prevent for pre-mature aging for the entire day! 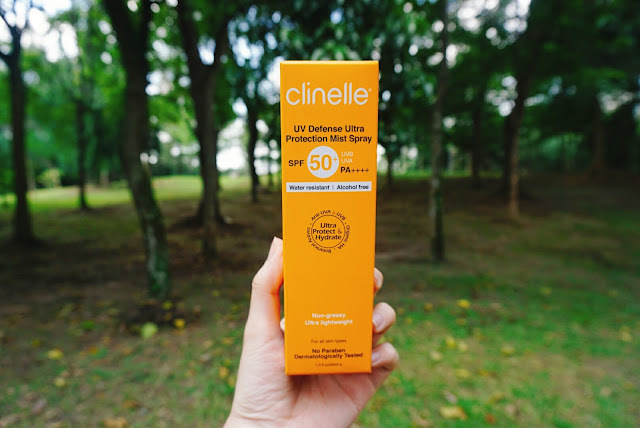 Clinelle UV Defense Ultra Protection Mist Spray SPF50, PA++++ is available at AEON Wellness, Caring, Guardian, Watsons & selected independent pharmacies nationwide. 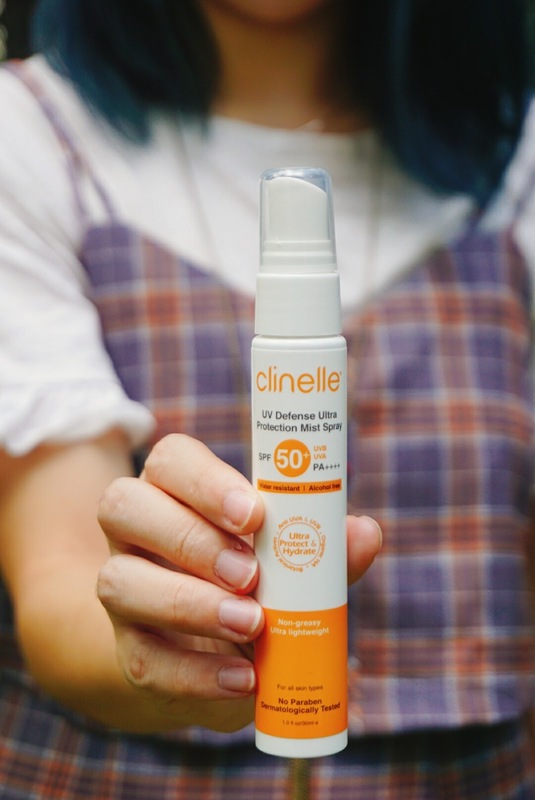 In keeping with all Clinelle skincare products, Clinelle UV Defense Ultra Protection Mist Spray SPF50, PA++++ has been dermatologically tested for its tolerance and efficacy. Therefore, it is suitable for all skin types including sensitive skin. All Clinelle products are also formulated with 7 Secrets to Happy Skin which altogether excludes potential harmful ingredients: No artificial coloring, No artificial fragrances, No lanolin, No mineral oil, No SD-alcohol, No Paraben and No comedogenic ingredients. Fundamentally, all Clinelle products work effectively to free skin from rapid environmental aggressions with RX3 Action, to Repair, Refine and Reshield skin for optimized skin health and clearly visible and long-term results. Clinelle skincare is distributed by EIG Pharma Asia Sdn. Bhd., the global partner of Esthetics International Group Berhad (EIG). Listed on the Main Board of Bursa Malaysia Securities Berhad since March 2004, EIG is one of the market leaders in the beauty and wellness industry in ASEAN, Hong Kong with over 33 years' experience in the industry. The Group has regional offices in Singapore, Hong Kong, Indonesia, and Thailand with the headquarters located in Selangor, Malaysia. 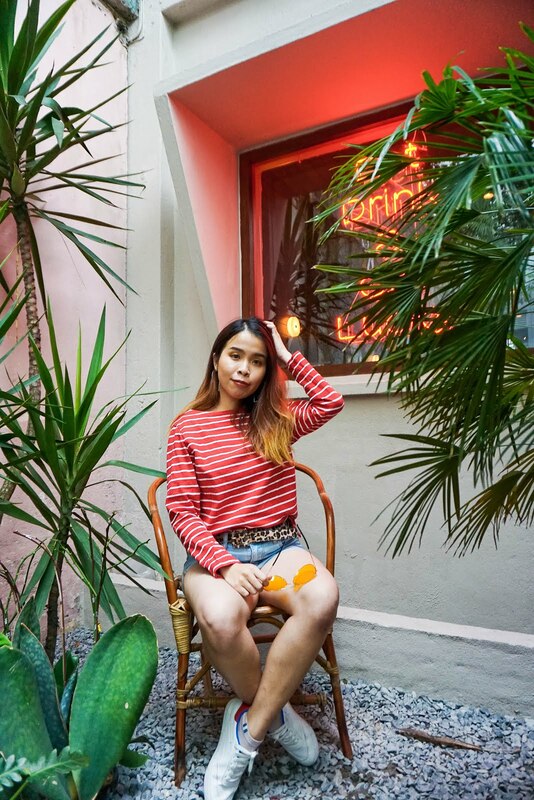 The group’s strengths lie in its exceptional market reputation, a wide range of quality products, excellence in education and training, an extensive network distribution and a loyal customer base. Yess!! I really love it!! I previously used the Biore sunscreen mist, and now using the aqua gel version. This is a cool brand, i want to try it as well. I don't really use sunscreen even though I am out under the sun so much. Of those that I tried, I never used spray before. I worry about the waste of the mist not getting onto my skin. Looks like I should give it a try. It was a really good product! You should try! !